Have double the fun with Zing Toys's Double Shotz. The Double Shotz comes with two PopShotz blasters and 6 target cans, you're set up for some awesome action on the range. Load them up and play with a friend or go double-barrel, solo style. Have double the fun with Zing Toys &apos;s Double Shotz. 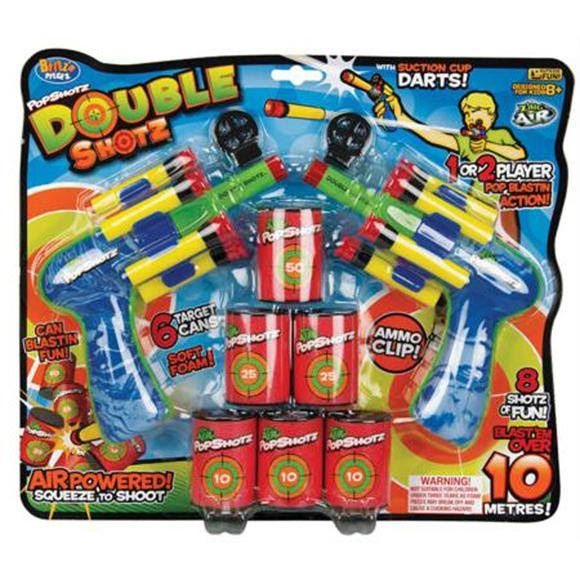 The Double Shotz comes with two PopShotz blasters and 6 target cans, you&apos;re set up for some awesome action on the range. Load them up and play with a friend or go double-barrel, solo style.